Rain-X Rain Repellent not only repels raindrops from your windscreen, it also helps to stop ice and frost from sticking so firmly to the glass, allowing you to defrost your vehicle that little bit quicker in the mornings. For a first-time application, the best way to apply Rain-X Rain Repellent, is to ensure your windscreen is thoroughly clean of any dirt, grime or other substances from car washes. You can do this by using Cif (bathroom/Kitchen) Cream Cleaner, diluted with a little water and apply this with a soft cloth to the windscreen, rubbing in a firm, circular motion. This will remove any substances from the glass surface without causing any damage. Once you are confident the windscreen is thoroughly clean, just rinse until completely clear of any Cif cleaner or residue. 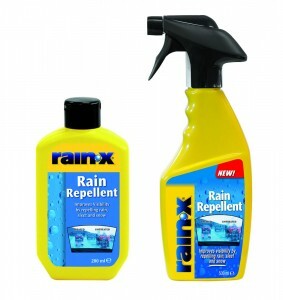 Rain-X Rain Repellent is available in a 500ml trigger spray bottle, or in a 200ml dropper bottle, and just needs to be wiped onto the exterior glass surface using a circular motion. Allow this to dry and then buff off with a dry cloth. If a haze appears then just sprinkle with a little water and buff again. Please ensure to just use a small amount of Rain-X Rain Repellent, as not a lot of product is required for full effectiveness. Your now ready to go in any wet weather, and should you wake up on a frosty morning, it will help ensure the frost isn’t so stubborn to remove! A Rain-X treated windscreen makes wet weather driving and frosty mornings that little bit easier, and when you notice the effectiveness start to wear off, you can either top up the treatment when it needs it with the Rain Repellent Solution again, or try out 2-in-1 Glass Cleaner with Rain Repellent wipes for a quick and easy application while on the go! Each application should last that little bit longer as the Rain-X coating builds up over time.